A new study conducted by WU researchers that will be published in February 2019 and has already been released online, provides new insights how different types of real-world events (polarizing events such as elections, negative such as acts of war, or positive such as public holidays) affect the emotions and the corresponding communication behavior of social media users. In a data science project that is located in a computational social science context, Mag. Ema Kušen and Prof. Mark Strembeck of WU's Institute for Information Systems and New Media study which types of emotions are triggered by different types of real-world events and how these emotions affect the communication behavior of social media users (e.g. on Facebook, Twitter, or YouTube). This also involves the analysis of differences in the communication behavior between human users and so called social bots (automated software programs). In particular, the project currently investigates the research question how positive, negative, and polarizing real-world events influence the communication via social media channels. Among other things, current results show that: 1) emotional content is forwarded considerably more often than neutral messages, regardless of the corresponding emotion valence [KS2018d], 2) human users disseminate a considerable amount of positive messages during negative events [KSC2019 , KSCC2017], and that 3) social bots emotionally polarize during controversial events (such as elections) in order to sway social media discussions [KS2018e]. 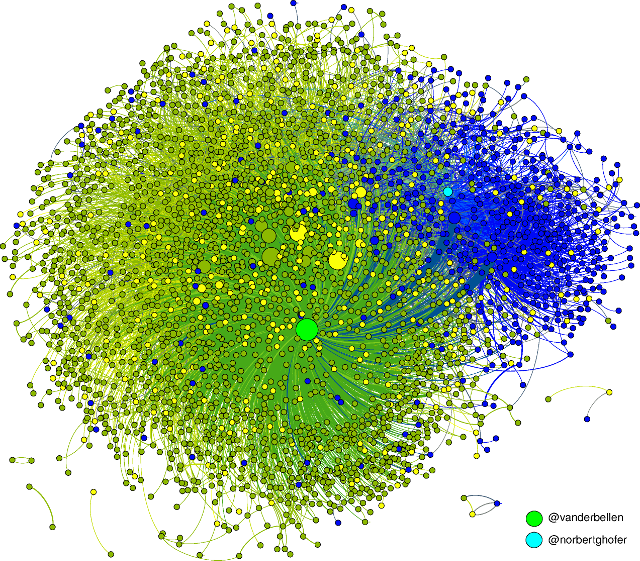 Figure 2: Excerpt of the Twitter communication network for the 2016 Austrian presidential elections. From numerous research results in the field of human psychology it is known that emotions significantly affect human communication behavior. Corresponding studies from the fields of psychology and sociology traditionally involve comparatively small groups of several hundred individuals. The widespread availability of so called "online social networks" which, in 2019, connect some hundred million users (e.g. Twitter) up to some billion users (e.g. Facebook), now provide unprecedented possibilities for studying communication behavior. The research project investigates how emotions impact communication behavior in social media channels. This includes the use as well as the (un)intended misuse of social media, e.g. for the purpose of swaying the public opinion. Since social media significantly impact public discussions as well as the perception of events in basically all areas of human life, the project also investigates how human users and social bots differ in their communication behavior [KS2018a, KS2018b, KS2018e]. Social bots are software programs that automatically produce messages and interact with human users on social media platforms. The investigation of social bot communication behavior is relevant because a number of studies already provided evidence that these software programs sway public discussions and political processes (such as the 2016 US presidential elections or the so called "Brexit" referendum in Great Britain). First, the public APIs provided by Facebook, Twitter, and YouTube have been used to systematically collect different data-sets. This collection includes events that are primarily perceived as positive (such as public holidays or the birthday of a celebrity), events that are perceived as negative (such as terror attacks or acts of war), and events that are polarizing in nature (such as elections). For the subsequent analyses, the data-sets have been anonymized. The different analyses conducted in the project include structural network analyses as well as temporal analyses concerning the impact of different emotions (anger, anticipation, disgust, fear, joy, sadness, surprise, and trust [KCFCS2017]). Led by WU researchers, the investigations have been conducted in an interdisciplinary team of computer scientists, mathematicians, and psychologists. The analyses found empirical evidence that substantiates the existence of the "undoing hypothesis" in online social networks [KSC2019 , KSCC2017]. The undoing hypothesis originates from the field of psychology and says that during negative events (such as terror attacks, acts of war, or natural disasters) one can still observe a considerable amount of positive emotions that express empathy and care. According to the undoing hypothesis, such positive emotions serve as an emotional antidote during negative events. The two WU studies [KSC2019 , KSCC2017] are the first that provide empirical evidence for the undoing hypothesis in online social networks. A detailed analysis of the Twitter discussion on the 2016 Austrian presidential elections [KS2018c , KS2017] found that: 1) the winner of the election (Alexander Van der Bellen) predominantly sent tweets resulting in neutral sentiment scores, while his opponent (Norbert Hofer) preferred emotional messages, 2) negative information about both candidates continued spreading for a longer time compared to neutral and positive information, 3) there was a clear polarization in terms of the sentiments spread by Twitter followers of the two presidential candidates, 4) the winner of the election received considerably more likes and retweets, while his opponent received more replies, 5) the Twitter followers of the winner substantially participated in the (unintended) spread of misinformation about him. An analysis of the social media discussions on the riots that surrounded the 2017 G20 summit in Hamburg, Germany [KS2018d] found that on each of the three social media platforms that have been analyzed (Facebook, Twitter, YouTube): 1) negative emotions of high arousal (anger and fear) dominate in messages mentioning the police but these negative emotions are not necessarily directed at the police, 2) emotional content was forwarded considerably more often, regardless of the corresponding emotion valence. A study that includes social media messages related to 24 systematically chosen real-world events [KS2018e] found that: 1) social bots emotionally polarize during controversial events (such as elections) and even inject polarizing emotions into the Twitter discourse on harmless events such as Thanksgiving, 2) humans generally tend to conform to the base emotion of the respective event, while bots contribute to the higher intensity of shifted emotions (i.e. emotions that do not conform to the base emotion of the respective event), 3) bots tend to shift emotions to receive more attention (e.g. in terms of likes and re-tweets). In a follow-up project, Ema Kušen and Mark Strembeck are currently investigating how emotions shape the structure of social media communication networks. In particular, this includes the identification of so called "network motifs". Network motifs are statistically significant communication patterns, i.e. patterns that do not appear by chance. An analysis of differences in the communication behavior between human users and social bots will again be an important aspect of the project. Some intermediate results have already been published [KS2018a, KS2018b].